After PM Netanyahu's visit to Oman and Chadian President Deby's visit to Israel, the Jewish State is expected to continue promoting its ties with the Arab world; 'There will be more such visits in Arab countries very soon,' Netanyahu implies during a joint press conference with Deby on Sunday. Israel is working to establish diplomatic ties with the Gulf State of Bahrain, which are expected to be announced soon. Prime Minister Benjamin Netanyahu hinted at contacts being held with the Muslim country during his joint press conference with Chadian President Idriss Deby on Sunday. "A few minutes ago, we discussed in my office the great changes that are taking place in the Arab world in its relations with Israel. And this was manifested in my recent visit in Oman with Sultan Qaboos. And there will be more such visits in Arab countries very soon," Netanyahu said. The Persian Gulf State, which has a population of 1.4 million, does not have diplomatic relations with Israel. Bahrain has a small Jewish community of 40 people, and it is the only state in the Persian Gulf with a synagogue. Several Bahraini Jews hold key positions in the country. Huda Ezra Ibrahim Nunu, a Bahraini Jewish woman, served as Bahrain's ambassador to the US between the years 2008-2013. Attorney Nancy Dina Kadouri is of Jewish descent, and serves as one of the members of the upper house of the National Assembly in Bahrain, whose members are appointed by the king. After Netanyahu returned from Oman last month, officials in Jerusalem said the next Arab country to host Netanyahu would be Bahrain. As with Bahrain, Israel and Oman do not have diplomatic relations. The meeting was the first between the leaders of the two countries since 1996. In 2000, with the outbreak of the second intifada, Oman severed its ties with Israel. 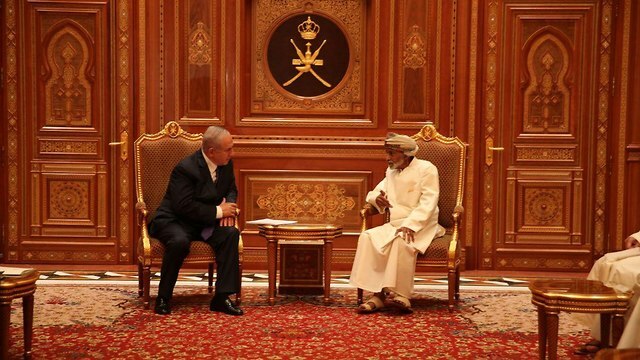 Over the past several years, the media has reported on secret communications between Israel and Oman, with one report indicating that Israel was about to open a secret consulate in the port city of Muscat. As part of the US administration's efforts to set in motion a political process between the two countries, the Americans worked to convince Oman to normalize its relations with Israel. In the past, the Sultanate announced it would resume diplomatic relations with the Jewish State, if the latter agrees to freeze construction in the settlements. See all talkbacks "Israel works to establish diplomatic relations with Bahrain"